As it has evolved in my kitchen. 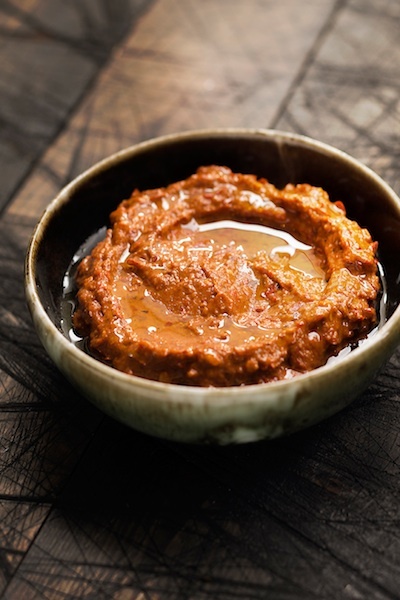 I like my harissa to be rich, hot, tangy, spice scented, sharp with a slight smoky character. Hence the inclusion of dry-frying some ingredients for smokiness and using saffron and preserved lemon for depth, tang and perfume. In a fry pan with no oil and on medium heat, press down the dried chillies until they start to darken, crackle a little and should make you cough. Turn over and repeat. Place in a bowl and cover with warm water and leave 30 mins to soften. Take the whole garlic and fresh chillies and also dry fry them, no soaking in water required. Take the seeds and salt, dry fry those as well and crush them in the large mortar and pestle you will need to get perfect flavour and texture. Blend if you must, but don’t tell me. Now, chop everything roughly that can be chopped and gradually, while pounding introduce quantities into the mortar. Only add more when the previous load has transformed to a textured paste. Finish with the oil. Wait at least 1 hour for the individual ingredients to meld into homogeny. Now, put it on everything. Mix it through cous cous, turn it into a dressing (see Moroccan inspired lamb chump chops), coat fish fillets and grill, stir it into soup, harissa on Turkish grilled will replace garlic bread… Somebody stop me!